Description	 MS in Greek on papyrus, Egypt, 3rd c., 1 partial f., 25x14 cm, text 1: 3 columns, 33 lines in Greek cursive documentary script; text 2: single column, part of 11 lines in an irregular Greek half-uncial. Context	 The collection of the renowned papyrologist Prof. Atiyah consisted of more than 677 papyri, mainly originating in Middle Egypt, including Oxyrhynchus and Fayum. 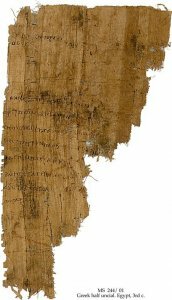 The first part of 140 papyri (H.P. Kraus cat. 105(1961)), is now in Yale, Beinecke Library, while 242 Greek papyri is MS 244 and 295 Coptic papyri is MS 245 in The Schøyen Collection, see also MS 108. Provenance	 1. Aziz Suryal Atiyah, Utah (-ca. 1960); 2. H.P. Kraus, New York. Very few military pay registers have survived, and the level of legionary pay at different periods has been much disputed. Traditionally, legionary pay was instalments of 75 denarii. In the 3rd c. and beyond, pay rates escalated, either by increasing the size or by increasing the number of the instalments. This evidence for the continued use of the 75-denarii instalment in the 3rd c. is of importance. Text 2 has so far resisted all attempts of identification. It seems to be hitherto unknown Greek literature. Published	 To be published by Rosario Pintaudi in Manuscripts in The Schøyen Collection series.